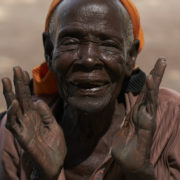 Mary is from South Sudan and is over 100 years old – though she’s not sure of her exact age! 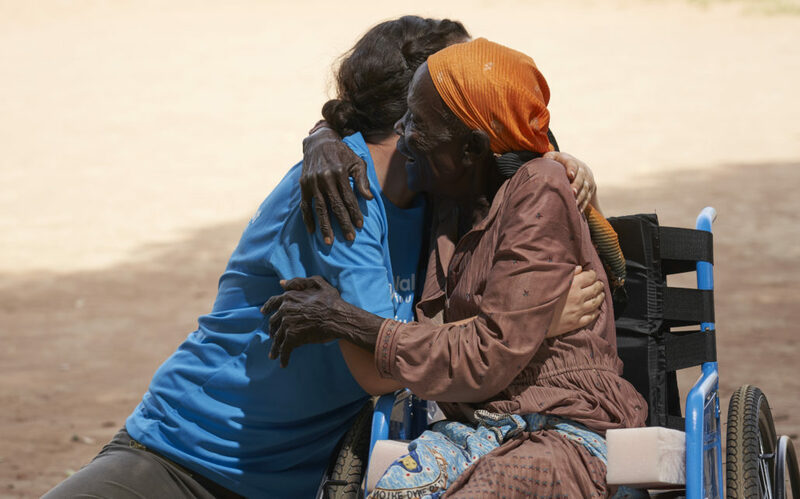 When she was 30, just after she got married, she was struck by polio – and hasn’t been able to walk since. She has never before had a wheelchair. Joel is 24 and living in one of the largest refugee camps in Northern Uganda. 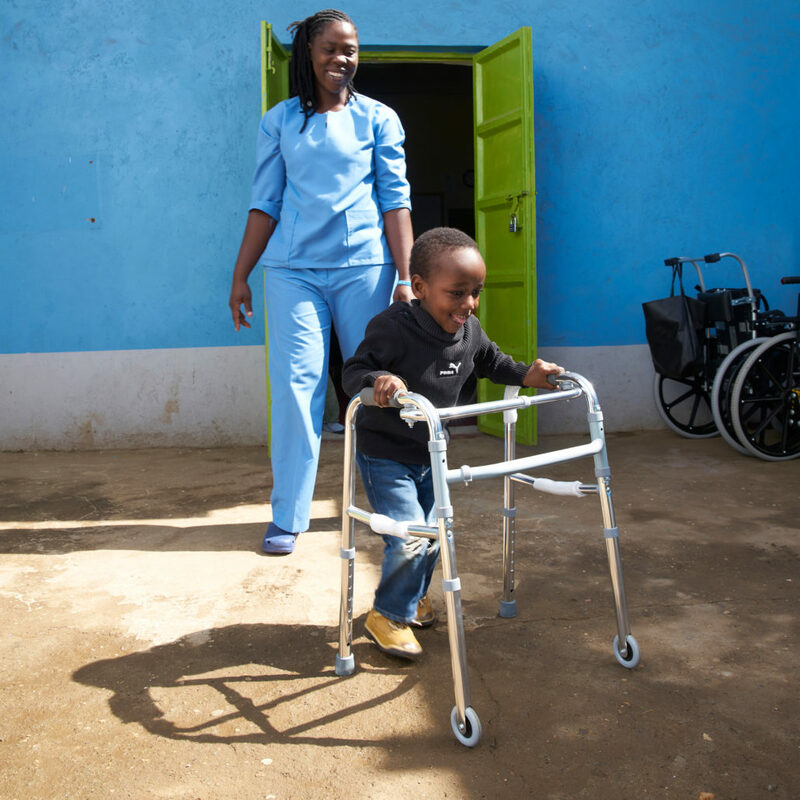 After surviving polio as a child, Joel lost the ability to walk and did not have access to a wheelchair. 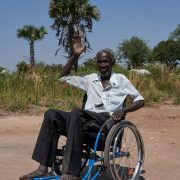 Even without a mobility aid, Joel was not without hope. He would crawl every day to school and then university, determined to fulfil his dream of becoming a doctor. 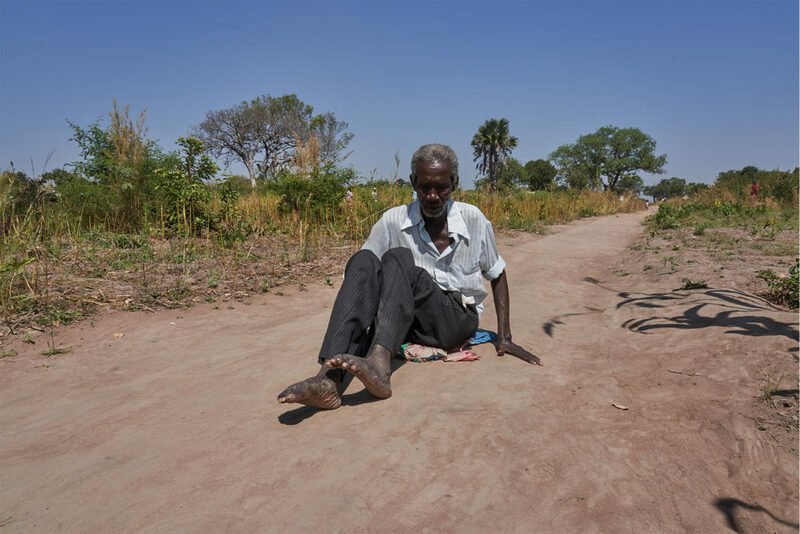 He only had two years of studying remaining when the war in South Sudan reached his village and he was forced to flee his home, carried on his family’s back. Though he is unable to complete his education whilst living in a refugee camp, Joel hasn’t given up! Instead he aims to participate in the 2020 Paralympic Games in Tokyo. 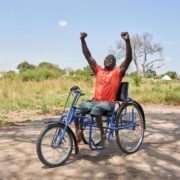 Regardless of the difficulties he faces as a disabled man living in a refugee camp, Joel remains optimistic and motivated, training every day in order to bring him one step closer to his goal. A tenacious, bright, strong-willed young man, Joel does not see limits when it comes to his disability. Walkabout feel privileged to have been able to give him a tricycle that will truly transform his life. Emmanuel is an adorable 12 year old with an incredible smile. 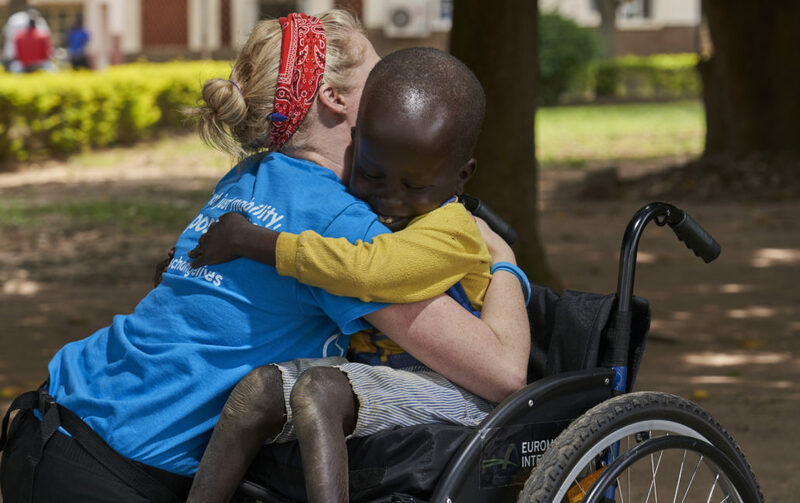 He was born with spina bifida and hydrocephalus, which has meant that he has never been able to walk. When his father found out about Emmanuel’s disability when he was just 6 months old, he abandoned his family, leaving Emmanuel’s single mother alone and unable to afford to look after her son. His uncle, who already had 5 children of his own, took Emmanuel in and raised him as his own child. 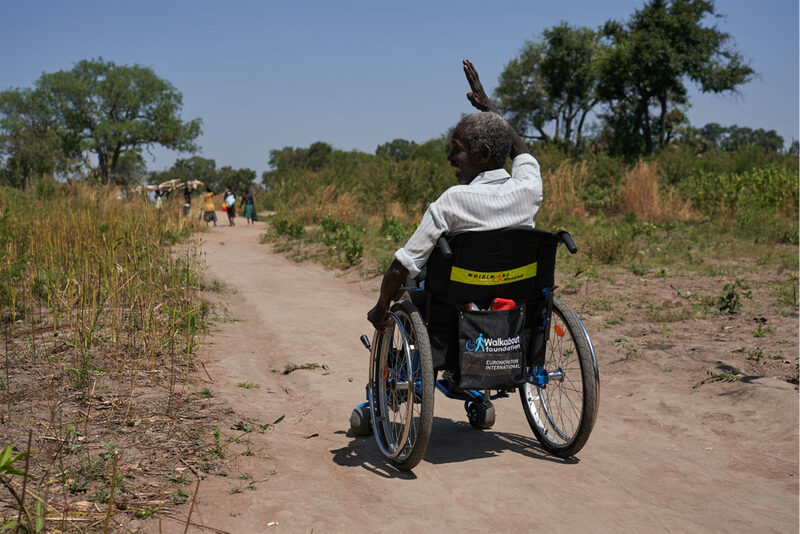 Because he’s never before had a wheelchair, Emmanuel is often left at home alone while his cousins go out to school or to play with other children. 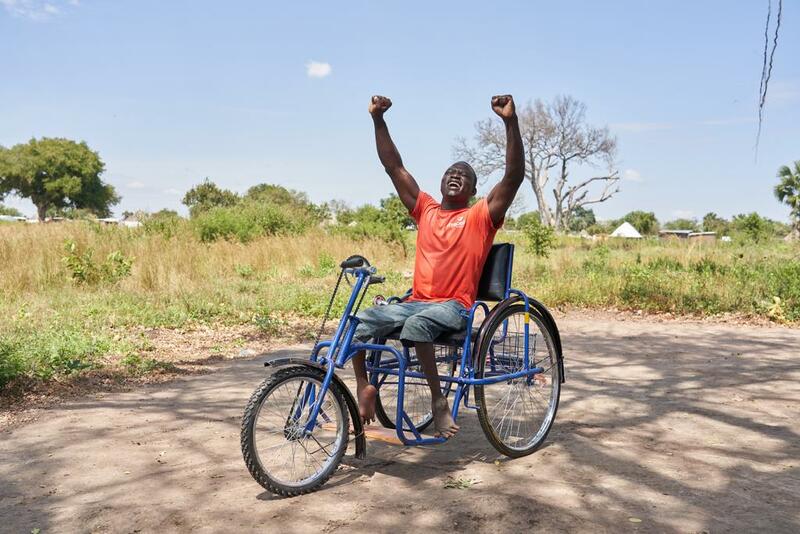 He was so excited about his new chair that he had spent the past few weeks telling everyone in the village about it – and that he’d finally be able to join his cousins at the local school. A real charmer, he clapped our team for every adjustment we did on his chair – and didn’t stop beaming throughout! Sierra Leone is a beautiful, green and mountainous country and yet considered one of the poorest in the world. It has suffered through a long, dark history of a 10 year civil war, followed by an Ebola epidemic, leaving the country in a stage of extreme poverty, but things are slowly changing for the better. 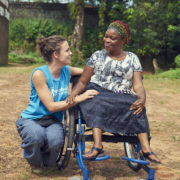 In September 2018, Walkabout returned to Sierra Leone to distribute 58 wheelchairs in the capital city of Freetown. 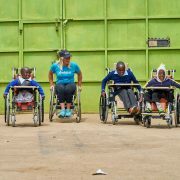 After our visit in 2017, which highlighted the huge need for wheelchairs throughout the country, we decided to partner with a local wheelchair workshop to coordinate regular small distributions and meet the ongoing need. 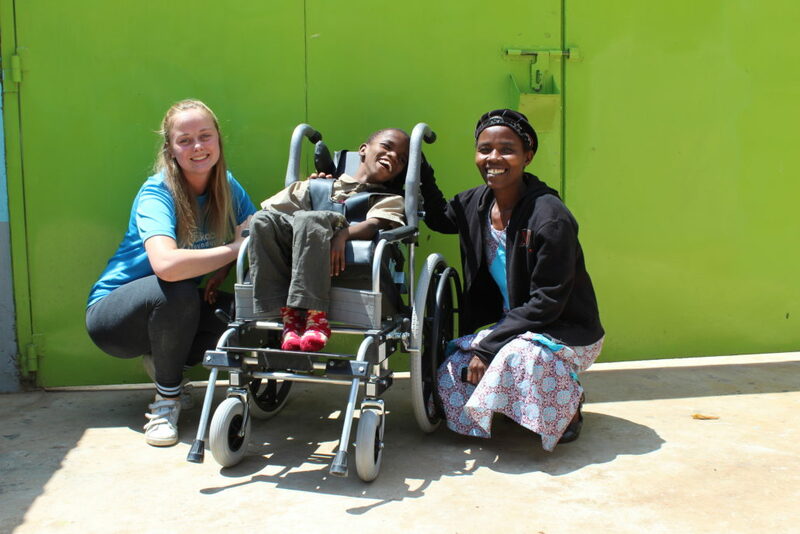 In July 2018, the Walkabout Team visited our Wheelchair Assembly and Daycare Centre in Nanyuki, Kenya, accompanied by four very special, young volunteers: Ines, Massimo, Giovanni and Greg. 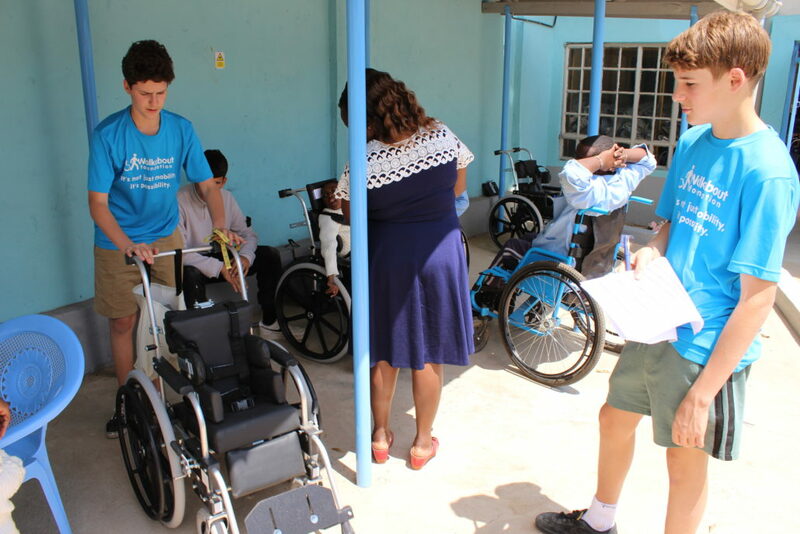 Driven by their energy and motivation, we distributed 60 life-changing paediatric wheelchairs. 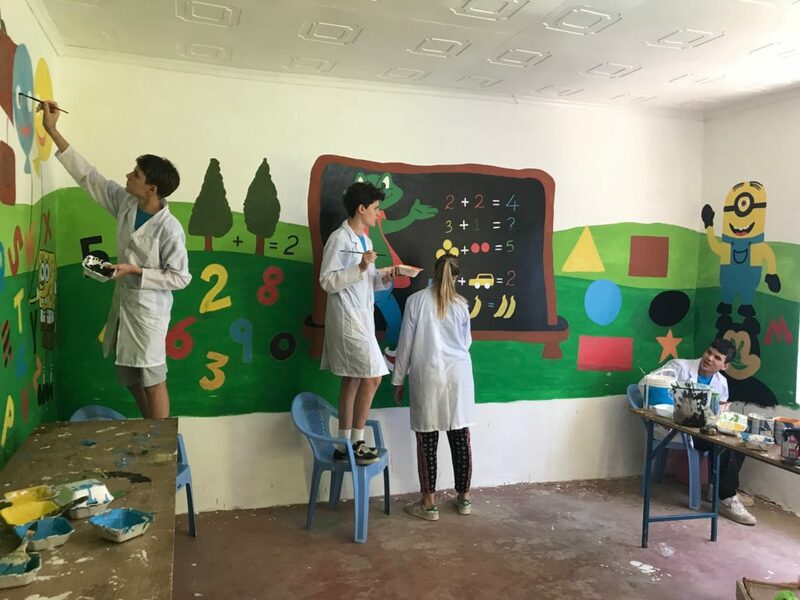 The young team also dedicated 2 days to painting the classroom walls in our Daycare Centre, where we provide rehabilitation for children with mobility disabilities. Our team added some favourite cartoon characters, showing exceptional artistic skill and creating a fun and interactive space. The kids were very curious about the whole process and the biggest challenge was to make sure that none of them snuck in, leaving their hand prints on the walls! We are so proud and grateful to our special volunteers for their hard work and commitment to our cause. 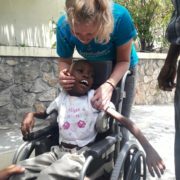 In June 2018, we headed to Haiti to distribute 163 paediatric wheelchairs. Haiti is one of the poorest countries in the Western Hemisphere, and has recently experienced massive political and social upheaval, with riots and violence leaving the country in distress. It is home to some of the world’s most underprivileged children. Selina is the youngest of 7 children. She was displaced from her home in South Sudan two years ago; her loving parents travelled for three days, her mother carrying her on her back, to get to safety at the Ugandan border. 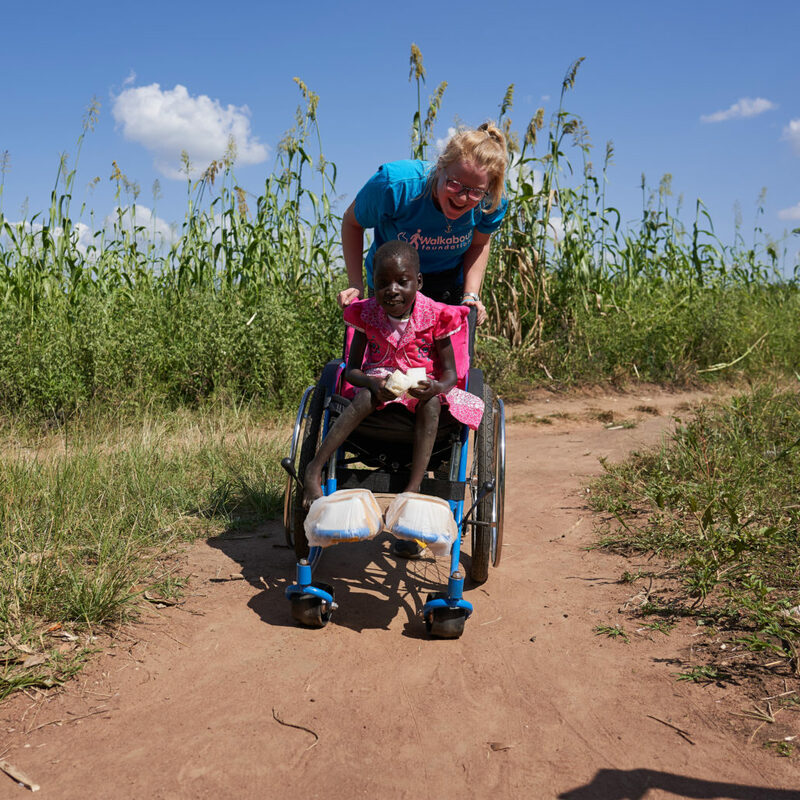 Born with cerebral palsy, Selina has never been able to walk, therefore relying on her older siblings to carry her to school. As she grew, she became too heavy for her sisters to bear her weight on the three hour walk, so they would often leave her on the side of the road and only pick her up on their way back home. 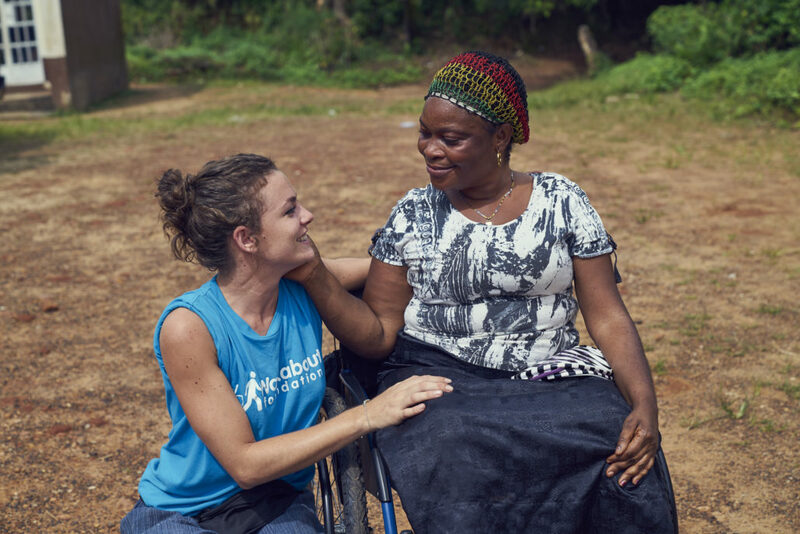 Now, thanks to her first ever wheelchair, Selina will be able to return to school, and she’ll be able to play with her siblings rather than being left inside alone. 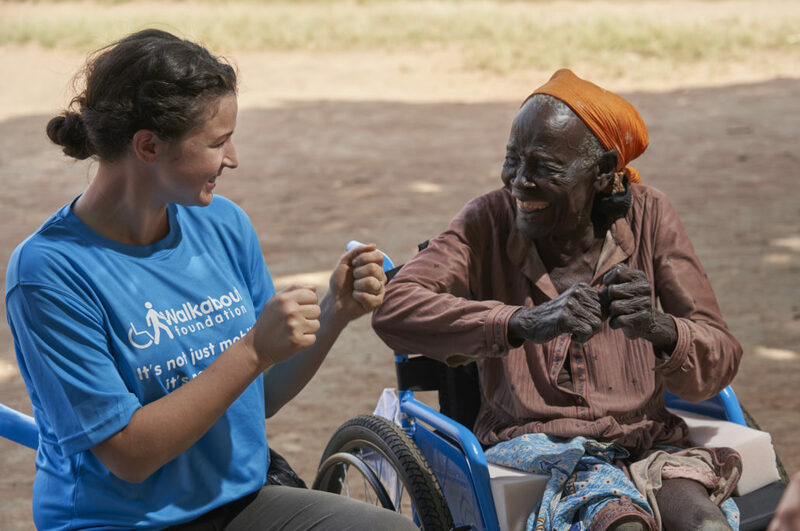 For Selina, her wheelchair means the opportunity to have a childhood – something that every little girl deserves. 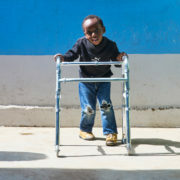 Kevin is 5 years old and lives with his mother Jane and younger brother in Nanyuki. He has cerebral palsy, which has meant that he has never been able to walk. Before he started attending the Walkabout Daycare & Support Centre, Kevin spent most of his time at home, not able to socialise with other children his age. A single mother, Jane was also forced to stay at home with Kevin, unable to go out to run the business that used to provide vital income for the family. Kevin joined our centre in 2016, and thanks to the regular therapy he has received so far, he has learnt to walk with a rollator and stand without support. 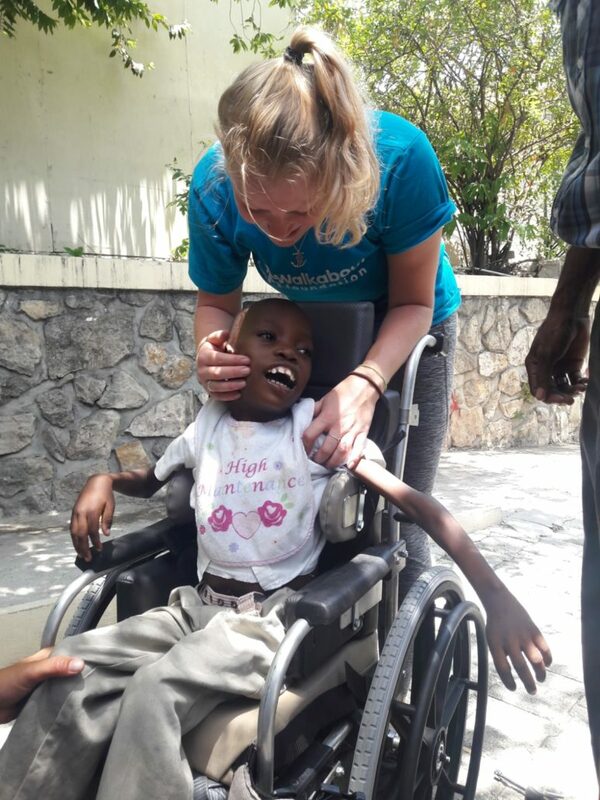 Jane says that he loves coming and interacting with the other children – so much so that sometimes he refuses to have breakfast in the morning because he’s worried about being late! 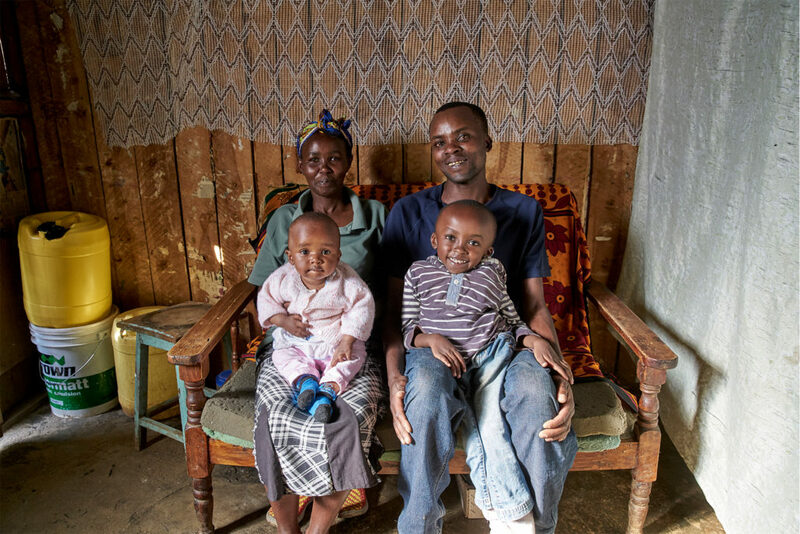 Joseph is 6 years old and lives with his father Samuel, mother Julia, and baby sister Eunice. Samuel is a self-trained plumber, but the work is temporary and he is often without a job. Since Julia is forced to spend all day at home looking after Joseph and Eunice, she is unable to work, and as a result the entire family must survive on less than $2 a day. 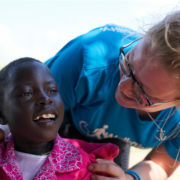 All four of them live in a tiny single room in one of the sprawling slums of Nanyuki, Kenya. Joseph suffered from pneumonia when he was just four months old, and again a year later. As a result, he has been unable to walk and has little strength in his hands. Because of this, he has not joined a mainstream school like most children his age, in spite of his clear intelligence. 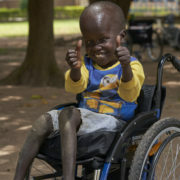 Since Joseph joined the Walkabout Daycare and Support Centre, he has made incredible progress. 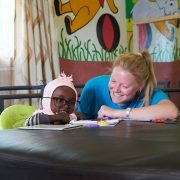 He loves being around other children, and now that he has been given the opportunity to learn, he is excelling in his education. The staff at our centre are confident that he will soon be able to join a mainstream school. Julia will now have time for a job and hopes to start a small business selling vegetables and charcoal. This will give the family a crucial second wage to live on, which will make a real difference, giving both Joseph and Eunice a brighter future.